My husband and I are in the middle of remodeling our kitchen and he gave me the job of searching for a new range hood. It sounded easy enough so I jumped to the task. After three days of searching, I found the perfect beautiful kitchen range hood. Upon showing it to my husband, he simply said it wouldn’t work since it’s not convertible. I said what? You never gave me any specifics. So back to the search engines I went and learned quite a bit along the way. There are the phrases ducted, duct-free, non-ducted, vented, non-vented, vent-less, convertible, and recirculating. Convertible and recirculating is what I needed to focus on. We have vaulted ceilings. Therefore our old range hood was not ducted through the ceiling. Our kitchen also happens to be in the middle of the house. Since it’s not attached to an outer wall, it’s not vented outside. Venting outside is always recommended, but we did not want to put the extra work into it. The convertible range hoods can be mounted ducted or non-ducted. Therefore, the air can be recirculated if needed as in our case. 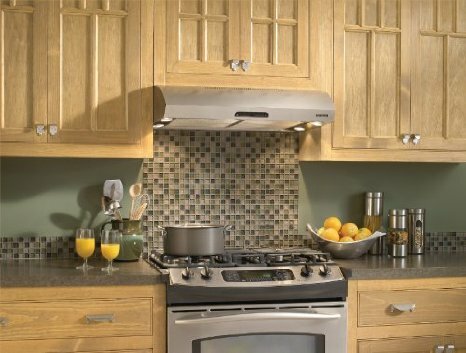 Most range hoods come with a metal mesh or baffle filter. These types of filters are used when venting the air outside. The mesh and baffle filters are dishwasher safe. However, for recirculating the air, a charcoal filter is necessary to trap and remove the smoke and odor from the air. These charcoal filters are usually not included unless your range hood is manufactured for recirculating only. Charcoal filters usually need to be replaced every two months or as needed depending on the amount of cooking done. We were in the market for a 36” stainless steel hood to match our stainless steel appliances. Your hood should always be as wide as your cooktop if not more. And since I wanted to bring my kitchen into the modern age, I opted for a touch screen LED display instead of the typical rocker switch or push buttons. Some units are sold with the push buttons or rocker switches hidden underneath, or on the front as my LED display is. In addition, I wanted the unit to be completely enclosed underneath for an easier clean up. Now there were the CFM’s to be concerned about. These numbers indicate how much air your range hood will move. I was looking at range hoods with CFM’s from 100-900. Of course the higher the number, the better the unit is at removing the smoke and odors caused by cooking. Most range units have different levels for the fan operation. Therefore, the first setting will have a lower CFM and the last level will have a higher CFM. The higher the CFM, the more noise the unit will make. I was also looking at the types of lighting provided by the range hoods. Most of the hoods have two halogen lights toward the front. I chose one with four halogen lights. Two lights on the front, two lights on the back. Now there are units sold with Heat Sentry. The unit senses if your fan level needs to be increased due to the amount of smoke and automatically sets the fan to high. Unfortunately, the heat sentry will not let you shut off the fan until the smoke has been decreased. So after reading through all of the information, we found what we thought was the perfect range hood for us. Upon arrival, we noticed that the top of the hood is slanted downward toward the front. Therefore, there is a smaller flat surface for mounting to the underside of our cabinet. Upon measuring that flat surface, we realized it is made for 12” cabinets. Our cabinets are 15”. We were very disappointed that this information is not listed under any of the range hood descriptions. Some of the reviews suggested moving the hood forward and blocking the back of the hood. The unit we purchased is the Broan model QP236ss. It is a beautiful unit, so we opted to keep it and mount it as recommended. Since none of the range hoods online specify the size of the cabinets they are made for, it would be pointless for us to start our search again, without having to make phone calls to the individual stores. Our only concern with mounting the unit forward is the fact it may stick out further than needed and be in the way of cooking. Our first unit received had to be replaced since it had a small dent toward the top. I am assuming the metal is not of the highest grade, so I will have to be extra careful when removing items from the upper cabinet. I am afraid of dropping something on the unit and causing it to dent. I would recommend paying a little extra and purchasing a higher quality steel for this reason. I hope my research will help you in your search for your perfect range hood.